For a web browsing proxy and hidden services host, Tor gets the job done well. But if you are looking to expand your options for secure communication, then enter I2P! 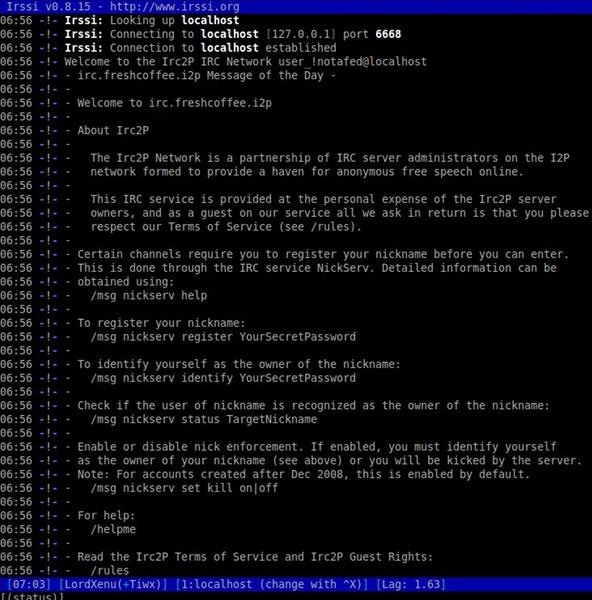 This article will show you how to obtain and set up I2P, and in the process, we will also configure an IRC client to access the IRC2P network and get you up and running. I2P initially began in 2003 as a proposed modification to Freenet. To deal with a wide range of attacks, I2P is fully distributed with no centralized resources— hence there are no directory servers keeping statistics regarding the performance and reliability of routers within the network. I2P is not 100% secure, as nothing is 100% secure, but using it will provide you with meaningful security nonetheless. Content sent over I2P is encrypted through three-layer garlic encryption, used to verify the delivery of the message to the recipient. All messages passing through a tunnel are encrypted by the tunnel gateway to the tunnel endpoint, and undergo inter-router transport layer encryption along the way. You also have the ability to tunnel TCP/IP based applications (IRC, Jabber, steaming music, etc.) through the network. In fact, you can even tunnel your torrent downloads! This downloads and installs the I2P router on your computer. After we type that command, the I2P router will begin to bootstrap itself into the network. It is recommended to give this process some time as it seeks out and adds other nodes for you to route traffic through. 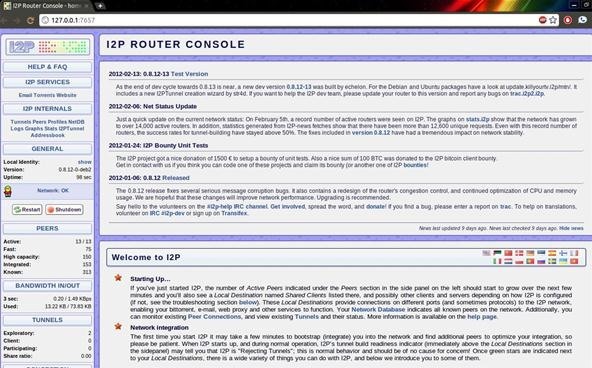 After a few seconds, I2P will open a browser with the router console as seen below. You may close this. That's it! You are now connected to the IRC2P network. You can use normal IRC commands such as /list to locate channels. Also please feel free to /join #nullbyte and #i2p and say hello! Just want the commands to get up and running? Look no further. See you in the Deep Web! there is a way to mine IP addresses with both I2P and Tor. Since the core of tor is about 2.5 K at most vs about 20K+ with I2P hosting on tor is MUCH more risky. With I2P you can't tell who hosts stuff and who doesn't host stuff. With tor leeching is encouraged more and hence it is generally easier to do ip mining based attacks. I wrote a script that queries an i2p user's local netdb (a database of all peers your router knows of) and looks for entries based on geoip data. Also... it would be great to allow anonymous (moderated) posting. This is great! I've downloaded tor and i2p and have been browsing. Im also using xchat. I saw that Tor has email services too. Are these anonymous also? Can these be accessed by outside emails (like can I send an email to gmail?). I wouldn't but just want to know how the Tor email works. I2P does have a clearnet i2p mail system but as for Tor you'd have to ask the people who run that. Hey bro can you help? I tried to install Tor on kali but it says "Tor should not be run as root"
Thanks. User base varies still. Sometimes we have a ton of people and great discussion and sometimes it is a ghost town. Is this secure? or will this open my computer up for people to have back door access? I love the idea and the thought. So again i did some research, but to know fruition. So i thought you might have some insight or leads i could follow. What are the risks of adding a i2p node on my network? If someone found my location, do they have complete access/control?